While still at school he was awarded a scholarship to study at the Guildhall School of Music and Drama and as a student undertook an extensive period of work with the Philip Jones Brass Ensemble. Having won the Mechanical Copyright Protection Society’s ‘Joyce Dixey Award’ for composition, he graduated from the University of Surrey with first class honours and joined the London Symphony Orchestra, where he spent twenty-seven years, twenty as Co-Principal Trombone. In September 2000 he was appointed Section Principal Trombone at The Royal Opera House, Covent Garden. In addition to the concert and recording work, he has performed on many of the most iconic film soundtracks, including the first four of the Star Wars series, Superman 1 & 2, Raiders of The Lost Ark. Braveheart, Aliens, Who Killed Roger Rabbit, Lord of the Rings, Harry Potter 1, 2 & 3, Willow, Krull, Die Another Day, Rat Race, Life of Brian, An American Tail, Honey I Shrunk the Kids, Long Walk to Freedom, as well as dozens more. As director of London Symphony Orchestra Brass for many years he regularly conducted them at the Barbican Centre and internationally. He has made five CDs with the ensemble: two originally for Collins Classics, American Brass and Cathedral Brass, (re-released as Brass Americana and Sacred Brass on Alto) featuring many of his arrangements, which are also available on LSO Live and three of a world première recording by Naxos Records of the complete forty-three instrumental ensemble sonatas and canzonas of Giovanni Gabrieli, for which he made a new performing edition, available from Brass Wind Publications. In 2011 Eric edited the complete works that the Belgium composer Paul Gilson wrote for La Fanfare Wagnérienne a brass group based at the Brussels Conservatory at the turn of the 20th century, using the brass instruments that Wagner used in his Ring Cycle. Extraordinarily, these works have not been performed for 100 years. He has made a world première recording of them on the Musical Concepts label with Guildhall Brass. released in May 2013. He has also written acclaimed arrangements for The London Trombone Sound and The London Horn Sound, for Cala Records, and has worked for many of the world’s most distinguished ensembles and brass bands in concerts, recordings, television and radio broadcasts. His symphonic version of Bernstein’s Suite from West Side Story has been commercially recorded four times. Three of his arrangements have been featured on a Chicago Symphony Brass CD on CSO Live. Recent original compositions include Silk Street Stomp written for the Guildhall School of Music Big Band and played at a festival of youth big bands at the Queen Elizabeth Hall, Two Antiphonal Fanfares performed at the Lord Mayor’s banquet at the Mansion House, Frighteners’ Gallop for 8 horns commissioned by the British Horn Society, Orage for 16 trombones written for Bone Lab and premiered at the Dartington Summer School, The Birth of Conchobar for symphonic brass and percussion for the Ulster Youth Orchestra, Three Sketches from Rackham for flute and harp, Flourish for solo trombone and Carillons for six harps for the Royal Academy of Music Harp Ensemble. In order to develop and extend his work for the large ensemble, he has formed The Symphonic Brass of London, a hand-picked group of Britain’s finest brass and percussion players who have performed at home and abroad to great acclaim. In January 2014 they released their first CD of French and Spanish music, A Bridge over the Pyrenees. 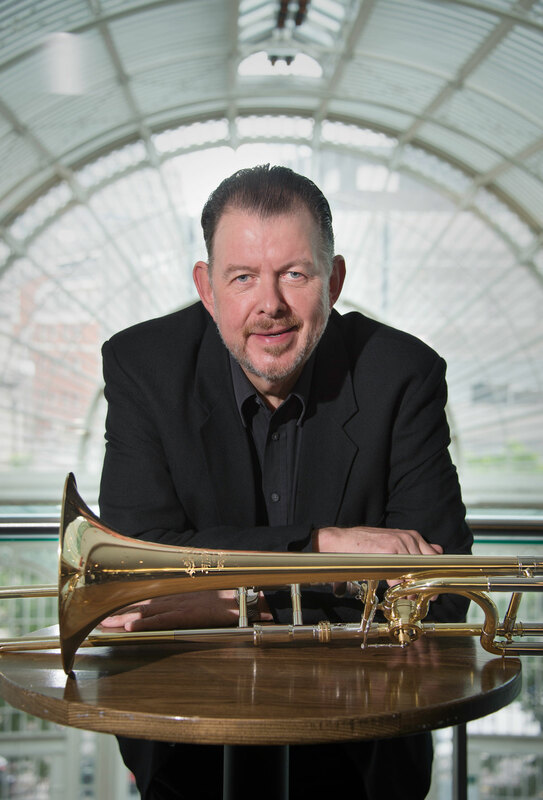 Eric is also an internationally renowned teacher and is Professor of Trombone, B.Mus. course tutor, Conductor of Wind, Brass and Percussion, and arranging and composing lecturer at the Guildhall School of Music and Drama where he was made a Fellow in 1991. In September 2014, Eric was awarded Conferment of Title to Professor in acknowledgement of his national and international standing and outstanding contribution in performing, recording, arranging, composing, the publishing of scholarly editions, teaching and academic leadership. He is a frequent coach at music colleges and specialist schools both in the UK and abroad, as well as the National Youth Orchestras of Great Britain, Belgium, Spain, the Ulster Youth Orchestra and the Pacific Youth Orchestra in Japan. Many of his students now hold important orchestral and teaching positions throughout the world. In March 2014 the International Trombone Association presented him with the prestigious Neill Humfeld Award for Teaching Excellence ‘In recognition of his distinguished teaching career and with deep appreciation for the inspiration and example he has provided for trombonists of our time’.